In laymens terms dare you write off winter pal? I am 100% convinced of this years 97-98 EN breaker being behind every relevant news story from recent aussie drought fires & our own flooding to eastern US heat & more. lots are clutching at straws for something seasonal but id like to see views regarding the current enso situation determining what realistic opportunities lay ahead for everything pv, ssw, ao, nao cetera? Just as we think El Nino is beginning to die, the MJO moves into the Western Pacific and kicks off some strong westerly wind bursts. This should result in another warm kelvin wave making it's way across to the east and slowing down or even reversing the decline of the current El Nino. Indeed, even the CFS forecasts now have the Nino 3.4 region remaining positive into next Autumn. Signs of the core heat being more central now. This reflected in the JMA composite map for January - showing a reasonable reflection of what we are seeing on current output. The huge Kara positive height anomaly is not there, this difference may retrogress the pattern to the benefit of those seeking cold. January Z500 pattern that goes with it. Also of note is that the PDO looks to be declining at fair speed. It may be that only this Nino event was able to pull it up via whatever mechanism and we may still be in a longer term -PDO mode. Nice kick in the Nino 3 and 3.4 regions in response to latest KW, also a little deepening of the thermocline in the WPAC, should keep this quite remarkable event going a little longer and perhaps strengthen the late season CP signal which has been trying to emerge between successive WWBs that just keep on coming!! Using tropical SST analogues is becoming increasingly difficult if not impossible this year!! Yep, a double peak El Nino is now looking likely, with the upper ocean heat content rocketing and the Nino 3.4 values back up near 3.0C for the last 10 days or so. That new big kelvin wave shaking things up a bit. This should also delay any shift to La Nina until the second half of the year, if at all. So with the East Pacific cooling nicely (latest temperature anomaly +1.4c) is this now a central based el nino? 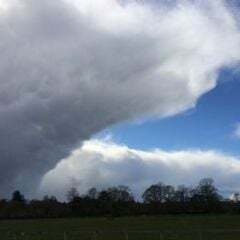 Thank you El, a complicated picture then but hopefully some promising signs for late February and early spring. Latest three month outlook from the UKMO has a rapid cool down in the ENSO region. It looks a bit strange to see such a narrow strip of negative anomalies, surrounded by so much warmth. Wouldn't be surprised given recent events (WWBs, Kelvin Waves) to see the feedbacks fighting on though, at least in the Central Pacific. So just to update you all from the 6th Jan to 3rd Feb.. Region 1.2 is seeing a relatively rapid fall now (though the last week saw a rise) while region 3.4 is stagnant. We see here that this is because region 4 is not loosing heat even if region 3 is. Absolute values on the 3rd.. Seems highly likely to me that we are about to lose this basin wide Nino and transition to a west based one. Looking at data this has not occurred in Spring since before 1980 bar March 2010 so analogues are sparse for west based forcing during Q2. Had another look (excluding the west/east based component) and if we take weakening springs with at least one Q2 monthly value of +1 or more then we get.. 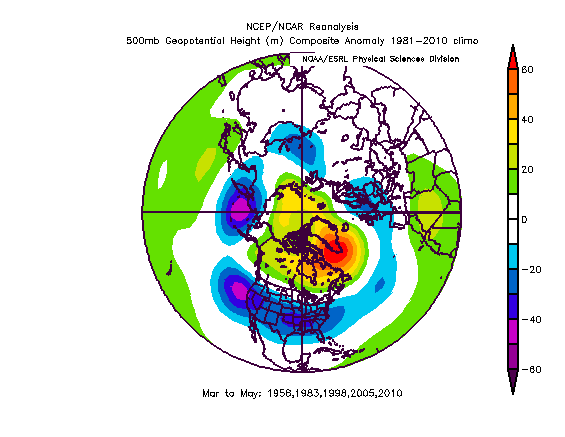 Strongest signals are for March and May to be within 1C of the 1981-2010 average but April to be below. The far-eastern Pacific is almost down to the El Niño threshold already. The trends on slide 9 are remarkable, with slight warming in the Central Pacific as the EP rapidly cools. I'd say the SST profile now qualifies as an El Niño Modoki event, and the atmosphere is responding slowly but surely. 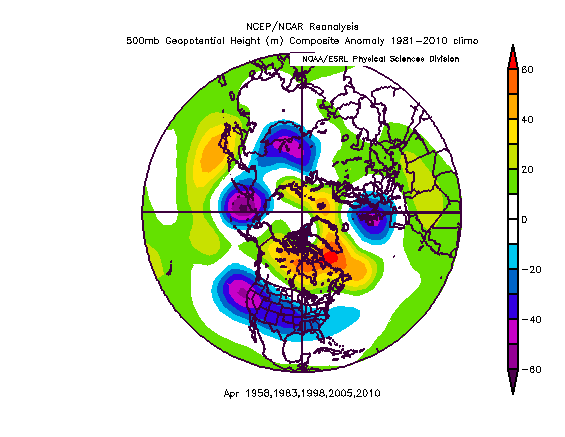 Still decent sub-surface warm anomalies under the CP (slide 12). In fact they increased slightly 2nd-7th Feb.
MJJ still suggested time of transition to neutral ENSO (slide 24). La Nina chances reach 50% by SON (slide 23). CFSv2 mean (slide 25) continues to sustain El Niño through to SON, in fact it edges up slightly for SON compared to ASO. Very wide spread in ensemble though, from -0.8 to +1.7*C.
Increasing detachment of Pacific Jet from Atlantic (slide 27) as upper ridge develops in EP - indicative of the move toward a CP El Niño atmospheric setup. (Could mean the stratospheric polar vortex is now the only thing standing in the way of a sustained -ve NAO?). 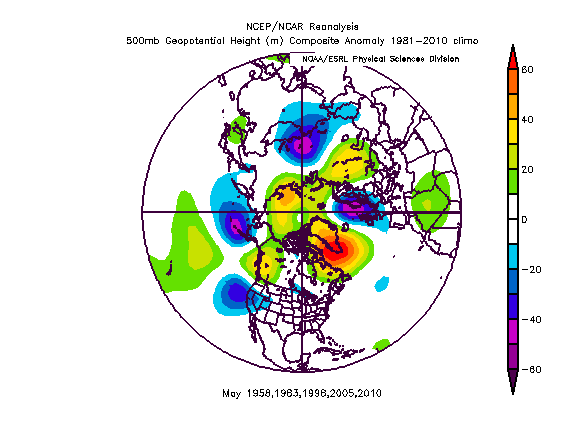 I suspect it's too little too late given atmospheric lag (especially if the absolute value of the east Pacific is more important than relative difference) however it does (assuming that it yields a -AO all year rather than meaning different in spring/summer than it does in winter) strengthen the argument of a cold April which is backed up by analogues. With the MJO moving through phase 6/7 over the coming days, more westerly winds will be added to the equatorial Pacific, which might help to transfer more warm water and slow the weakening of El Nino. Slightly off topic but does anyone know of a good source of data that lists all the known Nino years. I'm looking at the correlation of Cumbrian floods to an El Niño. Certainly the past 7 out 8 have been in El Niño years. This is a good quick reference point for further research. Klaus and Wolter developed a fairly robust MEI index using reconstructed analysis data characterizing ENSO behaviour since 1871. This MEI index this will take you back all the way. Other, possibly more suspect literature attempts to go back the 1600's to look at solar cycle impacts/relationship on/to ENSO but its not reliable, note the MEI index possibly over does the 1877/78 event surpassing the 1997/98, but I guess we will never truly know! Good luck with your research - you may want to investigate how the different ENSO classification "flavours" of warm events affects your results. I think the authors mentioned have written a paper (2013) perhaps which list these events since 1871 in order of their magnitude which may help you also. Thanks both, I shall put some time aside to digest all that info. I suspect there may be some correlation between solar activity, namely sunspot numbers and known flood events in Cockermouth. There are various theories that low solar activity can affect the jetsream. I might look into this. One thing I firmly believe is the flooding is part of a cyclical process and not global warming.